Today, the Vermont Classic Commemorative Silver Half Dollar Coin remembers when the colonists near Bennington, James Breakenridge in particular, refused to relinquish their lands to be resold by the governor of New York on October 19, 1769. In 1761 immigration became active from the States of Connecticut and Massachusetts, — at first to Bennington, and afterward to the Connecticut River Valley, augmenting the sparse settlement about Fort Dummer. By the time the decree of 1764 was published, placing the settlers of the “Grants” under the government of New York, a considerable territory had been taken up; and acquiescence to it might have been possible but for the retrospective interpretation of one clause, — that New York had always held lawful jurisdiction. Lieut.-Gov. Colden thereupon (in council) declared the Wentworth Grants “null and void,” treating the settlers thereon as trespassers, — not only under this decree of George III, but asserting an earlier title under the charter of Charles II to the Duke of York in 1664, — and proceeded to grant charters anew to these lands. This precipitated a long and bitter controversy, which ended only when the independent State of Vermont became strong enough to assert its rights, and the dark days of the war for independence in the colonies overshadowed local events like these. This duplication of charters, to lands owned by the pioneers, was fully as odious as the “Stamp Act,” and contributed toward the throwing off of a corrupt Colonial government. Gov. Wentworth is said to have become wealthy by reason of his charter-fees; Gov. Clark in New York, between 1736 and 1743, is alleged to have made £100,000 by reason of his office; Gov. Clinton (in ten years) is accredited with an accumulation of £84,000. In its incipiency, the clash of authority over the territory of the “Grants” was not singular. It was the experience of many other sections of the colonies, and is explained by the suggestion relative to the sale of charters and the reckless stipulations therein as to the surveys and boundaries involved. Not another controversy, however, carved out a rugged commonwealth like Vermont. In November 1766, the grantees of New Hampshire having paid the crown for their lands through Gov. Wentworth, and finding that redress could not be obtained of New York, appealed directly to the king, George III. Samuel Robinson, Sr., of Bennington, went to England, and his mission was, in a measure, successful. Under date of 24 July 1767 the issue of grants to lands already chartered by New Hampshire, was forbidden; but New York pretended the edict related only to patents thereafter to be issued. This was reaffirmed in 1771, and the order was never repealed. In 1768 and 1770, respectively, New York organized Cumberland County on the south, and Gloucester County on the north, east of the Green Mountains; in 1772 Charlotte County on the north of the west side, leaving the south part of the present Bennington County within that of Albany. These civil divisions were recognized until after the authority of George III himself was repudiated by the inhabitants of the Green Mountains. The “period of rest,” to which reference has been made, was under the administration of Sir Henry Moore, governor of New York, — the two years immediately prior to his death, 11 Sept. 1769. He was succeeded by the return to power of Lieut.-Gov. Colden who re-opened the era of conflict. Ejectment suits were brought by citizens of New York, in the courts of that colony, to dispossess the settlers under the Wentworth charters, and to enforce the plaintiffs’ rights under those of New York. In connection with an ejectment suit against James Breakenridge (modern orthography Breckenridge), a pivotal historical event occurred. Breckenridge owned a farm outlying both banks of the Walloomsac River, in Bennington, and had made extensive improvements before the claim set up in the legal proceedings became known. The pleadings stated that New York, in 1739, had granted a charter for the township of Walloomsac, and that defendant’s land was situated therein. Walloomsac was an irregular and carelessly bounded tract of 12,000 acres, a part of which lay in the Bennington of the Wentworth charter. The joint issue of the charter of Charles II and that of George II was news to the settlers, and was urged to make a test case, by land speculators, who had acquired this property at a nominal value received. The first service was made on Breckenridge 19 Oct. 1769, coupled with the “quit rent” process. This was peacefully resisted, although Breckenridge and his neighbors were armed. This was the first act of revolution in the American colonies. On 19 July 1771 a final and equally unsuccessful attempt to dispossess Breckenridge was made by Sheriff Ten Eyck of Albany, at the head of a posse of 400 men. Both sides were armed, but the New Yorkers, not officials, were so much in sympathy with the settlers on the “Grants” that not a gun was fired. Vermont historians agree that here was the genesis of the future State. None of the leaders of the succeeding days had part in it, unless it may have been Seth Warner, who was a neighbor of Mr. Breckenridge. The citizens of Bennington, in town meeting, had decided that nothing should be surrendered to the plaintiffs in these suits until the king had passed upon the rights of the defendants; and to protect themselves additional military companies were recruited, — “The Green Mountain Boys” of song and story, commanded by Col. Seth Warner. 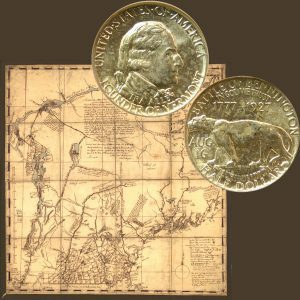 The Vermont Classic Commemorative Silver Half Dollar Coin shows with a map of New England, circa 1757, before the area separated from New York and New Hampshire.